by solving problems that nobody asked you to find. · Top 10 in App Store, twice. · Various industry design awards. 3 months for each app. Joel Marsh, UI Designer, Lead Engineer, several app developers, client’s tech team, photographer, copywriter, drink stylist, creative director, and a few project/account managers. UX design, algorithm heuristics, and some research. The drink pictured above is called a Blue Andy. To make it, fill a highball glass with ice cubes. Then add 1 part Absolut Vodka, ½ part Blue Curacao, ½ part Apple Juice. Top up with Lemonade. Garnish with a Lime wedge. Sound good? Why not try a few more drinks inspired by Andy Warhol’s work. In some ways, this was the project that every designer hopes to get some day. In other ways it was the most intimidating kind of work: full creative freedom with a big budget and high expectations. It was Absolut Vodka. One of the most iconic brands in the world. When we were given these projects, between 2010 and 2012, Absolut had already been working with the same lead digital agency for over a decade, so there was genuine trust among all the people in the room. The brief from Absolut literally only said “make the best app in the world”. With that kind of freedom and trust, many teams would have been tempted to go wild and make something that was more style and less substance. Not us. Instead, we started looking for real problems to solve, like we would have for any client that trusted us. With premium brands like Absolut, you can’t just “sell booze”. It has to be beautiful, intelligent, and creative, otherwise you’re just another bottle on the shelf. There was serious brand equity to consider here. But if people don’t actually use the app then they won’t spend much time with the brand. And that was our real objective. 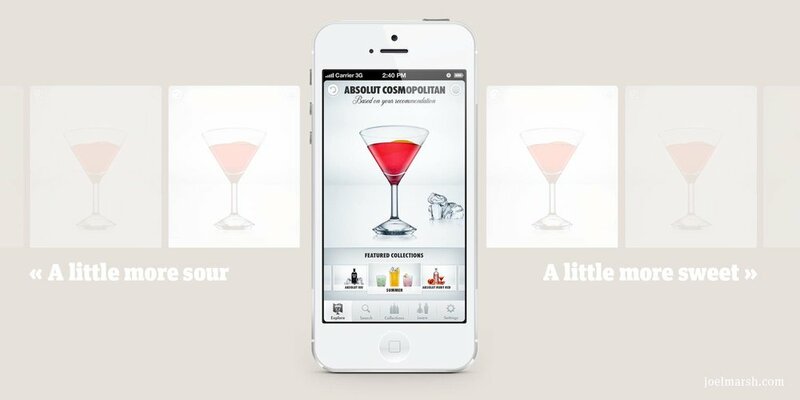 The more useful the app, the more time they spend with Absolut. Absolut’s brand strategy focused on drinks rather than the vodka product itself, which made it really fun to work with. They also had a massive database of drink recipes, and some very unique staff at our disposal, like a drink stylist who professionally made drinks look good in photos (and knew a hell of a lot about cocktails). In the end, both the iPhone and iPad apps were ranked in the App Store Top 10, received a long list of prestigious industry design awards, and the critical reviews complimented the apps for both their beauty and practical usefulness. Problem: The average person only knows 2-3 drinks. Research discovered that most people only know a few drinks well enough to order them at a bar. People are intimidated to order something weird because they don’t know what’s in it, and sometimes neither does the bartender. And what if you don’t like it?! Absolut had a library of 4400 drink recipes to choose from, but if you can only search for 2-3 drinks by name, you will probably never discover the value of such a great resource. So we decided to put an AI bartender in everyone’s pocket. We could now ask the user one question — "What’s your favourite drink?” — and the app could then suggest hundreds of drinks, with full recipes and photos, that you are probably going to love. With Absolut Drinkspiration, you could walk up to any bar, order a drink you have never heard of, even if the bartender didn’t know how to make it, show the bartender what it should look like, and be quite sure that you were going to love the taste. Problem: Nobody brings an iPad when they go out. An iPhone can be in your hand, wherever you go. An iPad, not so much. So the bartender-in-your-pocket approach wasn’t going to work for an iPad app. We needed to do more research. One of the things that people loved about the iPhone app was how it made them feel. Mixing and ordering drinks, as everyone knows, is a very social experience. But being good at it, made people want to share the experience with friends. All drinks aside, it felt awesome to walk up to a bar, order a sophisticated drink, and explain it to your friends — or even the bartender. And where can you feel like that and have an iPad with you? At home, when you have a party! We designed Absolut Drinkspiration “Home Edition” for iPad, to be an app that helps the user host a cocktail party at home. Parties bring lots of ingredients together, including games and conversations, and the iPad is a great companion in the kitchen, where people can mix and taste drinks together (and where an iPhone is too small to read while your hands are mixing, cutting, shaking, etc.). To make the iPad app more visual (and avoid reading while mixing) the search results were big images, not just text, and we included videos about how to use all the tools and methods needed for every drink in the library. It was basically a mixology course for free, personalised for every person or party. Users could search for recipes based on what they had in the fridge, a specific flavour, a particular mixing tool they owned, or whatever remained as supplies started to run out. The app also included hand-picked, magazine-style drink collections, so you could focus your party on themed cocktails, complete with the history of each drink. Or you could just “spin the wheel” with your finger and get drink suggestions for people who — remember — still only know 2-3 drinks by heart.